There are 5 National Park Service Sites in Nebraska. One of these sites, Missouri National Recreational River, is shared with South Dakota. This national monument is located in Harrison, Nebraska and was established in 1997. This unit of the national park service sites in Nebraska covers 11,617 acres of land area. The most prominent features on the site are the valley of the Niobrara River and the fossils on Carnegie Hill. In fact, this site is notable for the large collection of preserved Miocene fossils, most of which were concentrated in the University and Carnegie Hills. According to archaeologists, these fossils date back to 20 million years ago and the Miocene fossils are mostly from mammals. There is also a museum on-site that exhibits over 500 artifacts from Capt. James Cook’s Collection of Plains Indian. This unit of the national park service sites in Nebraska that commemorates the passage of Homestead Act of 1862. This particular Congress Act permitted any qualified individual to claim 160 acres of federally owned land if they promise to live in that land for 5 years and cultivate or improve the said land. This act enabled 270 million acres of public land to private ownership. The location of this national monument is in Gage County, Nebraska. This is where the first few acres were successfully claimed after this act was passed. This national recreational site is shared by Nebraska and South Dakota. It was initially designated as one of the national park service sites in Nebraska in 1978. However, the site was expanded in 1991 to include a 39-mile section of the river: from Fort Randall Dam to Niobrara. These two sections of the river that were added to the property are the only sections in the river that remain unchannelized or undammed. The property is managed by the US National Park Service and covers 33,800 acres in area. There is also a cultural value to the property since this has been the site of human settlement in the past 10,000 years. In fact, archaeologists had been able to gather ruins of weapons and tools, former homes, ceremonial and other religious objects close to the river. Many archaeologists believe that the river and its surrounding property served as a pathway for the American Indians, steamboat captains, Lewis and Clark expedition, and many other settlers. This is another unit of the national park service sites in Nebraska that encompasses a river: the Niobrara River. This river stretches over 76 miles and along four counties in Nebraska: Cherry, Brown, Keya Paha and Rock counties. When it was designated as a national scenic river in 1991, the aim was to protect and preserve the outstandingly remarkable values of the river and its surrounding area. This includes the high-quality water resources in the river, wildlife and fish, the scenery, and the fossil resources within and near the river. Furthermore, the Niobrara River has been developed to offer recreational facilities for tourists. With nearly 55,000 tourists who visit the river each year, there are plenty of recreational opportunities available. Canoeing in the river remains to be the most popular activity among tourists though; in fact, the river has been named as one of the top 10 rivers for canoeing in the country, according to Backpack magazine. This national monument is located in Western Nebraska and is one of the iconic landmarks in the state. The site includes an important 19th-century landmark along the Oregon and Mormon Trail. The main features within this national monument are multiple bluffs or steep hills. However, there is one of them that is most prominent and it is named Scotts Bluff, to which the national monument is named after for. The Scotts Bluff rises up to 800 feet in height in its highest point. There are five rock formations consisting of this monument and they are called Crown Rock, Dome Rock, Eagle Rock, Sentinel Rock, and Saddle Rock. 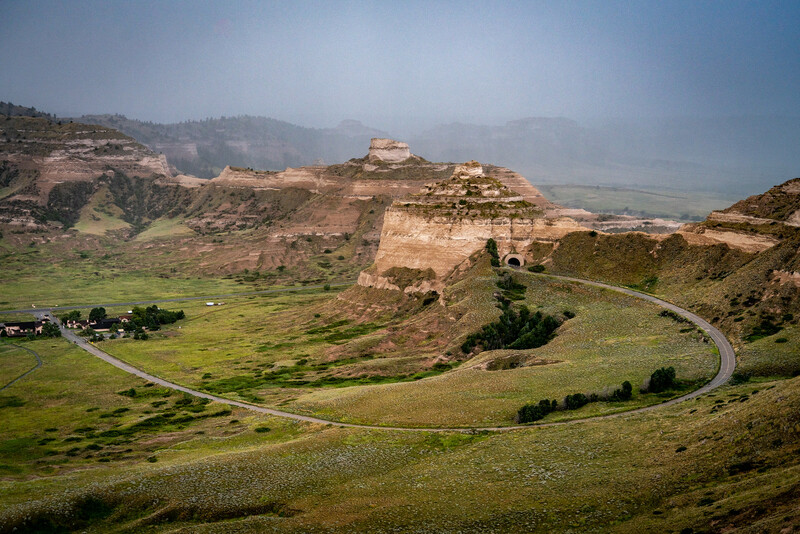 These bluffs are scattered across over 3,000 acres of land area in Nebraska’s Scotts Bluff County. More than 128,000 tourists visit this monument each year. You can also visit the Oregon Trail Museum and Visitor Center located at the base of the bluff. For hiking tours, the visitor center serves as the starting base.